Use the interactive graphic below to learn not only about the composition of the Legislature, but how members voted on 10 key or interesting bills during the recent session. The bills are summarized below the graphic. In the graphic, each bubble represents a Senate or House member, and the bubbles are colored according to party affiliation — red for Republican, blue for Democrat. 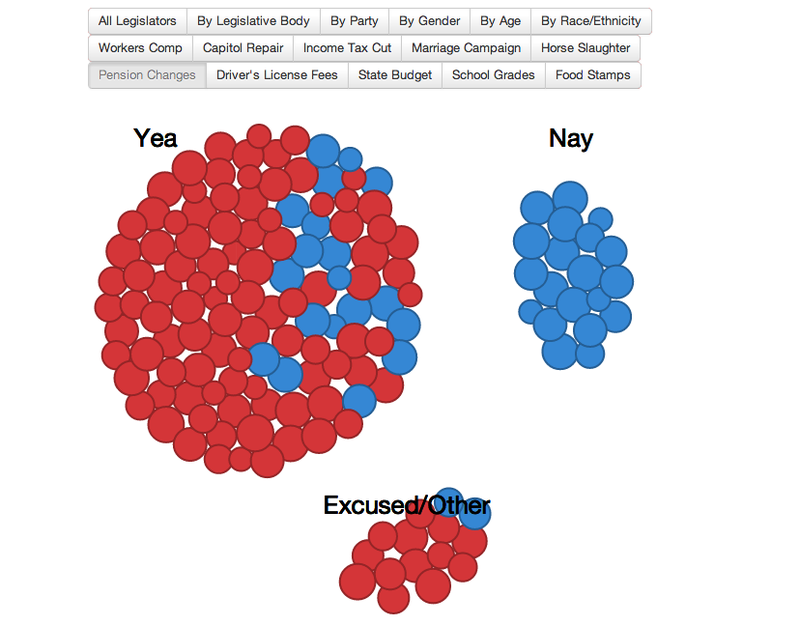 The larger the bubble, the longer the legislator has served in office. The Senate and House votes on final versions of the bill are combined. Related story: The gender and other gaps in the Legislature. Workers Comp (SB 1062): Passed. Changes the workers’ compensation system to try reducing legal and medical costs and try curbing excessive payments to employees, saving businesses money. Opponents argued it will unfairly slash worker benefits. Capitol Repair (HB1910): Passed. Addresses the state’s maintenance issues, including the repair of the State Capitol, using state revenues in a “pay-as-you-go” approach as opposed to issuing bonds. Income Tax Cut (HB 2032): Passed. Reduces the top tax rate from 5.25 percent to 5 percent in 2015. The cut will cost the state $136 million annually and save taxpayers an average $82 per return. The rate drops to 4.85 percent if there is sufficient revenue growth. Marriage Campaign (HB 1908): Passed. Creates a campaign of public service announcements under the Oklahoma Marriage Initiative to promote marriage as a tool to fight poverty. Opponents contend the PSAs will accomplish little or nothing to increase marriage. Horse Slaughter (HB 1999): Passed. The bill ends the state’s decades-long ban on horse slaughter and processing for export, but prohibits selling horse meat in Oklahoma for human consumption. Pension Changes (HB 2077): Vetoed by Gov. Mary Fallin. Would have revised the state pension system, allowing some state employees to choose between a defined-contribution plan, such as a 401(k), and a traditional defined-benefit plan, which is currently in use. Driver’s License Fees (SB 652): Passed. Raises the cost of a standard driver’s license by $12, to $33.50, effective Nov. 1. Fees for various commercial licenses and permits also will increase. It is expected to raise $8.7 million. State Budget (HB 2301): Passed. The $7.1 billion budget includes increases for common and higher education, health and human services and money for State Capitol repairs and legislative office renovations. Critics questioned the use of general revenue for Capitol repairs and said the funding for education lags needs and student growth. School Grades (HB 1658): Passed. Revises the system of giving schools grades A through F. It adjusts the weighting given to criteria for assigning grades, such as the bottom 25 percent of students, and adds pluses and minuses to the grades. Food Stamps (HB 1909): Passed. Requires able-bodied people ages 18 to 50 who are not disabled or raising a child, and who have received food stamps for three months, to work at least 20 hours a week to continue receiving the benefit. Sources: Oklahoma Legislature, Oklahoma Ethics Commission. State officials have released a list of 85 public schools in Oklahoma that spent anywhere from $76,000 to more than $1 million per school to build safe rooms for students.